Vehicle Accessories...Your source for truck & auto accessories. Check out some of our top selling vehicle accessories! We have an extensive background selling and installing automotive aftermarket products including: Spray-on Bed Liners, Nerf Bars, Tonneau Covers and Bed Covers by Access, Truxedo, Extang, and Rugged Cover, just to name a few. We also sell and install Fiberglass Truck Caps and Lids by A.R.E., Century, and ATC. Our service is our strength with customer satisfaction being our goal. 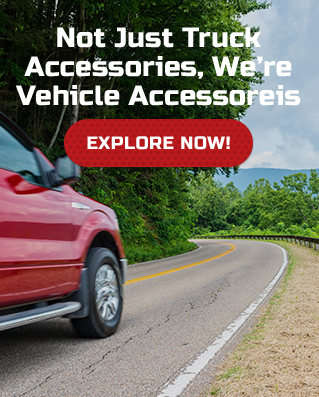 So, if you are looking for auto and truck accessories for your Chevy, Dodge, Ford, GMC, Nissan, or Toyota, give us a call Toll Free at 1-866-820-2119.